Elissa Glucksman Hyne, senior policy analyst for Children’s Rights, was recently interviewed about the issues faced by children who age out of foster care. You can listen to the the Ohio-based radio program All Sides with Ann Fisher here and find a transcript of the interview below. Elissa Gluckman Hyne’s segment begins around the 17:30 minute mark and ends around 33:00. Ann Fisher: In Ohio, about 1000 kids per year age out of the system, out of about 15,000 to 17,000 kids in the system. Is that typical? Elissa Glucksman Hyne: Right now, it’s unfortunately somewhat normal or typical. In 2016, more than 17,000 youth aged out of foster care. It’s an alarmingly large number and percentage of children that don’t find permanent homes by the time they reach the age of 18 to 21 years old. AF: What are the challenges in finding them a home? Is it just they don’t have a home, they don’t have a decent job, it’s kind of a ripple effect? EGH: There’s a difference between finding them a home and finding them just housing. For children in foster care, it should be temporary. These children should enter into the system, and either go back to the families they came from or find permanent homes that can take them in. There are lots of reasons why a child may not be able to find a home by the time they reach the age of 18, 19, 20, or 21, but that shouldn’t be the case. 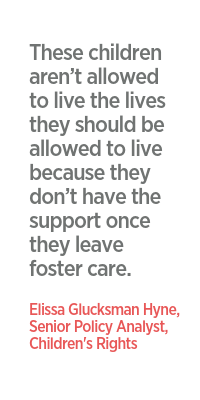 Every child should be able to find a home by the time they leave the foster care system. AF: This project we’re talking about in a neighborhood of Columbus, two aging motels, they’re going to convert them into 100 efficiency unit apartments. But most importantly, there are all these wraparound services that you’re alluding to. They need more than just a place to put their boots. EGH: Absolutely. All sorts of social science studies and neuroscience studies have found that this age, 18 to 21—or really 18 to 25 years old—it’s emerging adulthood. These young people aren’t adults yet. Their frontal lobes are still growing. It’s really an incredible time of growth and change for these young people. And so they need more than just a house. They need that support system. That’s the case for children who aren’t aging out of the foster care system. They need that support of adults in their community around them. Having those wraparound services is vitally important. AF: What kind of wraparound services are we talking about? Education, but what are we really talking about here? EGH: It’s really things across the board. It could really be something as simple as helping these young people learn how to balance a checkbook, making sure they know where their birth certificates are, making sure they can get a driver’s license. It could be things as simple as that, along with really providing support when they’re making big life decisions—having those adults around them that they can go to when they’re trying to make these large life decisions that a lot of children who age out of foster care just don’t have. Or having someone they can go to when things aren’t going well. And that may end up where they end up being homeless or getting involved in the criminal justice system, but for having a support system of adults they can rely on to go to in times of crisis. AF: Sounds like a lot of mentoring. EGH: It’s a lot of mentoring, and that doesn’t just come from someone showing up one day. It needs to be a long process of having youth be able to trust the adults around them. A lot of youth who age out of foster care simply don’t have that support system and don’t trust the adults that are around them. AF: We’re talking about the challenges of youth who age out of the foster system. [listener question] How do you help the ones that could really do something with their lives, that could be high-achieving? EGH: One thing that recent federal legislation has really focused on is ensuring that children don’t have to move schools whenever they move placements both when they’re in foster care and when they’re leaving foster care. We call that educational stability. Studies have shown that every time a child switches schools, they fall back 4 to 6 months every time. Even those children who really want to do well in school and are high achieving, it’s hard to keep up. Making sure children remain in their schools – and that could mean setting up a bus that will come and take them or making sure that there’s someone who will drive them to school – is incredibly important. There’s a lot of services out there for children who are 18-21 years old who are in foster care that can receive stipends or support to go to college but they first have to get through high school. Ensuring educational stability is just as important as ensuring that there is funding for them to go to college afterward. AF: When did our society start to wake up to the struggles for youth aging out of the foster care system? EGH: I’d like to say far earlier than it did. But really it wasn’t until the 90s that we started realizing that children were aging out of foster care had really terrible results that they were coming up to. The first huge piece of legislation was in 1999, called the John H. Chafee Foster Care Independence Program. That’s what really started allowing states to keep children in foster care if they wanted to up until age 21. Before that it was really once a child turned 18, they were considered an adult and were considered to be able to handle their life just like any other adult would, which is incredibly difficult. I’d love to say that it’s been decades and decades, but it wasn’t until 1999 that we started focusing on this population. AF: What happened then that woke us up? EGH: There have been intensive studies. One focused on children in the Midwest and followed them longitudinally from the time they exited foster care to age 26. The study saw the incredible barriers they had to overcome. Children aging out of foster care graduated from high school at a far lower rate: 58% of children graduated from high school by age 19 out of foster care, compared to 87% from the general population. Only 4% went on to graduate from college versus 36% of the general population. 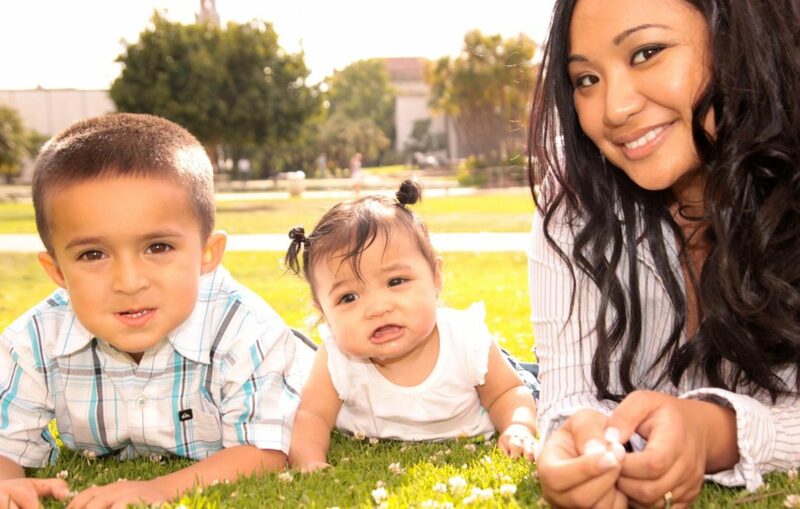 70% of female foster youth became pregnant by age 21. These terrible results didn’t happen for children in the general population. Only half obtained employment. These studies really hit us over the head with the conclusion: These children aren’t allowed to live the lives they should be allowed to live because they don’t have the support once they leave foster care. AF: And the role of housing in all of that is critical? EGH: Absolutely. 1 in 5 youth will become homeless after turning 18. That’s a huge barrier. A child who is couch-surfing or who’s just trying to find stable housing can’t focus on getting a job. They can’t focus on going to college. They’re just focusing on where are they going to lay their head every night. Finding housing is a massive first step in ensuring these children can achieve the lives that they should be allowed to achieve. AF: When they’re talking about this project in Columbus, they’re calling it a campus. It sounds like it could be a nourishing. It could be fun. They want to have people that are resident assistants, like RAs at a dormitory in college. How important is it for young people to have that opportunity? EGH: It’s incredibly important. That’s what a lot of children or youth who are not in foster care get to do. In a lot of ways, that’s what college is. You get to be an adult but have those support systems around you, so that if you stumble you have someone to catch you. This age – 18 to 21, or 18 to 25 – is really a time where there should be some experimentation and learning and growth so that they can develop into adults. At 18, they’re not fully adults. And so having that support system around them, those resident assistants and community support, is incredibly important. AF: What are some programs around the country you think are really stand-out in addressing the needs of youth aging out of the system? EGH: Before you talk about the programs that help youth in the system, a lot of these youth need support before they age out. A lot of time we start talking about these youth once they turn 16, 17, or 18. By that point, if they’ve been in the foster care system for a long period of time, they already have lost connection to their communities and the families in their lives. They may have already fallen around 6, 12 months in school and bounced around a few times. The first thing I will say is it’s incredibly important we focus on the foster care system as well as the services that help children who age out. It’s not just, let’s help these youth now that they’re 18. It really needs to be a process throughout the time they are in foster care. But there are some programs that have been shown to have good results, at least in some aspects of these youths’ lives. One of them is through this organization in Tennessee called Youth Villages. They have this YVLifeSet program. It provides a support system for these youth so that they meet once a week and talk about issues that happen in young adulthood, like housing issues, emotional issues, finding a job. Things along those lines so that youth have that adult support level they wouldn’t have otherwise. AF: Is it expensive to manage these programs? EGH: It’s not free. But it’s relatively cheap in comparison to what happens when these young people aren’t given any sort of supports or help in achieving adulthood. The Jim Casey Youth Opportunities Initiative put together a report that showed on average young people who age out of foster care cost communities and taxpayers $300,000 in social costs like public assistance, incarceration, and lost wages over that person’s lifetime. That amounts to almost $8 billion a year. These services in no way cost $8 billion a year, and so they are a relatively cost-effective options when the alternative is this incredibly high cost, not just to the individuals themselves but to the community at large. To learn more, read our Aging Out fact sheet.